This article has been written with the support of V&A Dundee. Find out more. Last year, V&A Dundee kicked off the Scottish Design Relay, a national project inspired by a selection of objects visitors will see when the new museum opens in September. 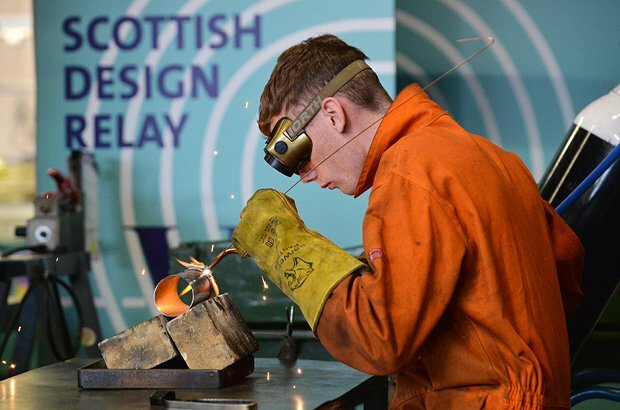 Over a period of eight months, teams of young people from six areas around Scotland were tasked with taking inspiration from an object in the V&A collection, working with local designers to develop and create prototype designs for display in the museum. The first team, employees from Michelin's Dundee factory, were asked to develop a design related to travel and exploration, using the Dundee-built RRS Discovery as a starting point. With Dundee-based designer Kevin Fox on hand to help, the team created a polar bear alarm system to protect explorers from deadly attacks. The relay's second leg took place in Orkney where participants studied an Orkney chair designed by David Kirkness. In Caithness, a detailed model of the Dounreay Fast Reactor was used as inspiration, while in Shetland, it was a Fair Isle jumper worn for golfing by General Sir Walter Kirke, and in Govan, a 'Clutha' vase designed by Christopher Dresser. Finally, in Aberdeen the focus was on an enamelled plaque from the V&A's collection by Aberdonian James Cromar Watt. Spectacular dance, design, installations and music will welcome Scotland's newest museum.